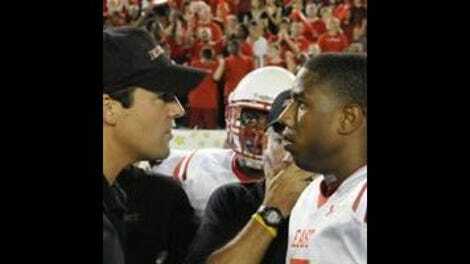 Friday Night Lights: "A Sort Of Homecoming"
Maybe the word “vampire” puts the stress in the wrong place. Friday Night Lights doesn’t idealize Dillon but it doesn’t posit it as a hell on earth either; It’s not Stars Hollow but it’s hardly Sunnydale. But Dillon as a problem: a tragic lack of reflection. It’s a town obsessed with football and in love with prosperity. One follows the other. The side of town with money gets more money. It gets the football team, too, while the other side lives in its shadow. And if the side in the shadows is predominantly black, well, that’s just life, right? Dillon gets along fine without anyone stirring up the trouble that comes with that kind of talk and it’s easier just to go along with what everyone else is doing, even if that turns you into someone you’d rather not be. But, with the reopening of East Dillon High, trouble has found the town again. Divided, unevenly, down the middle, it’s become a place where the line between the haves and have-nots has become clearer. Even that’s not the right terminology. Listen to sports talk and you’d think Luke Cafferty had been shipped to Siberia and not playing football for another team across town. Now that there are two schools, there’s Dillon and then there’s that other place across town that nobody talks about. Or, put another way, the place others talk down to. Reminded that East Dillon won a championship in 1983, Coach calls on some reluctant ex-Lions to revive the school’s team spirit. The Tami-prepared dinner doesn’t go well as Coach gets an earful about East Dillonites not appreciating being talked down to by their more prosperous, and white, neighbors. Then Buddy shows up and everything’s okay. Why? Because everybody loves Buddy. Friday Night Lights doesn’t put a lot of trust in institutions, like schools or town planning committees. But it has seemingly bottomless faith in the power of human contact—be it on the football field or over a steak dinner—to solve the problems created by those institutions. Still, it must be hard to be on the outside. Consider Tami, mocked until she’s left screaming at the radio in spite of knowing she did the right thing. And consider the habitués of Steers, the gay club outside Dillon where Julie, with a little reluctance, accompanies Devin and spies Coach’s ever-eager assistant coach Stan enjoying a game of pool. Spooked by the encounter, he’s unwilling even to acknowledge it later. Or, on a larger scale, consider East Dillon, a section of town so excluded from mainstream Dillon life we didn’t even see it for three seasons. I’m not sure how fruitful it would be to consider East Dillon life prior to the division of the town into two schools since the show seems to be using some pretty flexible logic in dealing with the town’s history and geography. (Were all these kids simply attending Dillon? Was there strife between the two sides then? If so, why did we never see it?) What matters is that it works dramatically now. I like the unease between Coach and his new team and his school’s new principal and the way the Coach Taylor name doesn’t carry as much weight on his new side of town. (And with Steve Harris’ character, it barely carries any weight at all, though he seems turned off by football in general for reasons we’ll find out at some later date, I’m sure.) And I’m also pretty much a sucker for stories that pit have-nots versus haves, though I’m a little worried that the series might have gone a little too far in making the more prosperous side of Dillon into unabashed bad guys. It’s one thing to be a devil town in the sense of Daniel Johnston’s song and another to be a town made up of nothing but unthinking heels. Still, I’ve got a lot of faith in the show’s ability to pay attention to shading. Take Vince, whom Coach rescues from juvie this week after he and Luke fight over Luke’s missing wallet. He’s not just a kid who’s made a few bad choices; he’s really not that nice of a guy. He stole the wallet, for one, and Jess alludes to him having a bad reputation for mistreating women. And, perhaps most unpardonably, his hotheadedness interferes with the team’s performance. Luke’s behavior doesn’t help either and their problems would seem to be of the sort that can’t be solved by one long walk home together in the dark. But then Coach probably knows more about that than I do. Finally, while we’re on the subject of male-bonding, it was great seeing Riggins and Saracen together again, going off on a hunting expedition where only one of them knows what to do. Saracen needs to get away more than Riggins, however, if only to unpack the resentment he feels toward Julie for imagining a life away from him and to finally admit he stayed in Dillon for her sake. The kid’s got problems. And as the episode ends, we learn his troubles have just begun. • Russell DeGrazier, who plays Stan, doesn’t have any other acting credits on the IMDB. But he does have writing and directing credits, including a 2000 feature named Attraction starring Tom Everett Scott and Gretchen Mol. We didn’t like it, but I’m enjoying his work here. • Forgot to mention Landry and Jess. I like Landry’s newfound refusal to be a doormat, which gives Jesse Plemons some new tones to explore. Smollett’s been terrific so far, too. The only new addition I’m not entirely sold on is Madison Burge as Becky. She plays young and annoying quite well, but I’m waiting for her character to be something other than young and annoying. • No episode next week (assuming you’re reading this as it airs on DirecTV.) See you in two weeks and have a happy Thanksgiving.